P2P content distribution allows to reduce server load which is going to be interesting for social and non-profit organizations and projects, also this may decrease network latency since peering could be set up in the way content to be delivered from the nearest peer available. 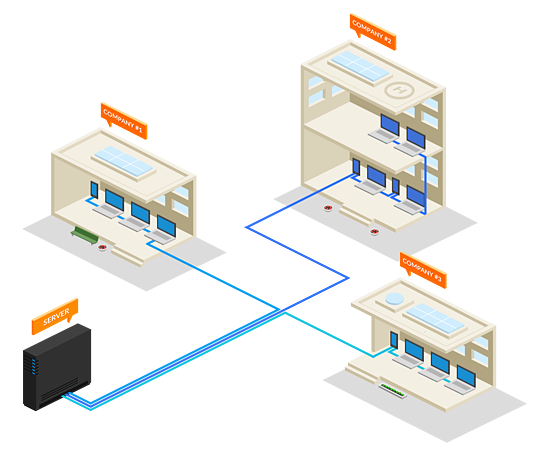 For example after hitting corporative network application will be delivered inside of it using high speed internal channels without creating a load on company`s internet channel. Pic.1 – Traditional app distribution. 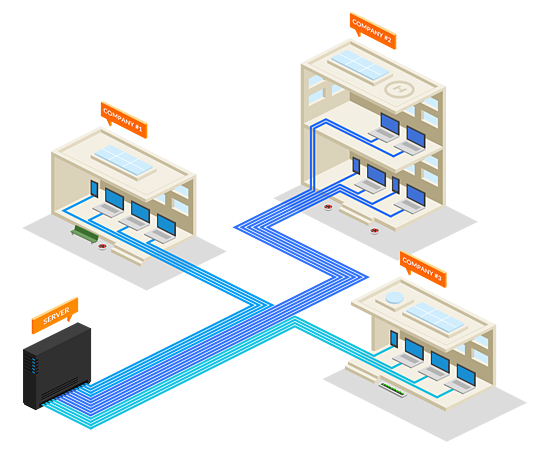 Server sends package many times, corporative internet channels are loaded appropriately. Pic.2 – In case of P2P distribution application hits corporative network once and then is distributed using high speed internal network. This reduces server load and corporative internet channel load. Or another case – once application got from USA to Europe it is delivered inside of European networks only without creating transatlantic traffic. Pic.3 – It takes a lot of transatlantic trips to transmit an app when doing it in a traditional way. 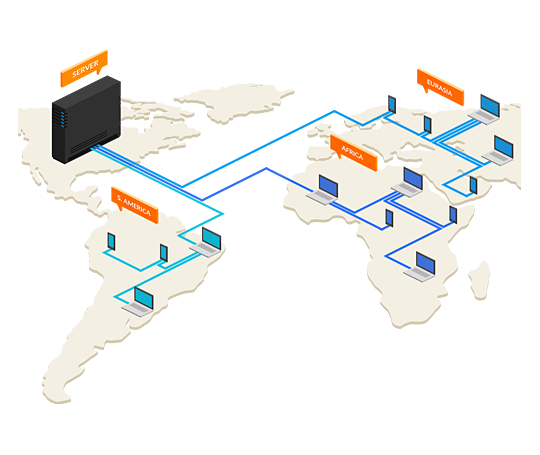 Pic.4 – P2P allows to reduce number of transcontinental transfers and reduce server load. 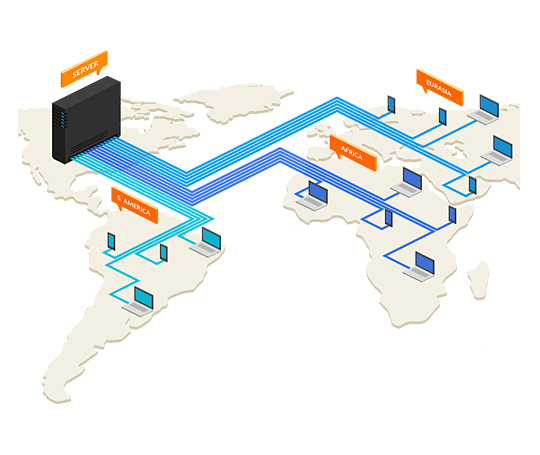 By distributing application via P2P you create a self-establishing and self-evolving CDN which moves data closer to client. How does viral Javscript work? 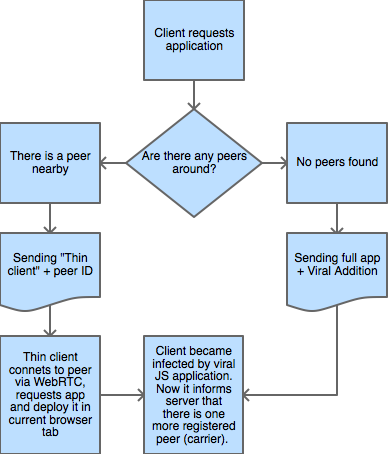 - When server receive a request for an app it determines are there any peers available nearby the requester. - Recipient executes code it received which launches application and makes him one more active peer. Algorithm is simple enough but requires pretty a lot of code to run and some details to be taken into account: How to send static files? How to cache content? How to render app on carrier? How to exchange P2P adresses? Easy answer to all of them can be ViralJS. Maybe beyond the horizon of distributed distribution in the browser is something like distributed general computing in the browser. “EtheriumJS” maybe? !